Mayo – Mulranny in particular – could now be the last stronghold of the rare, distinctive, gorgeously colourful and undeniably charming Old Irish Goat. The original and only landrace breed of goat in Ireland, its future hangs by a thread. While only individuals now exist in mixed herds elsewhere along the western seaboard, it is thought that the Mulranny hills support a small group of genetically pure animals and therefore hold the key to the breed’s future. 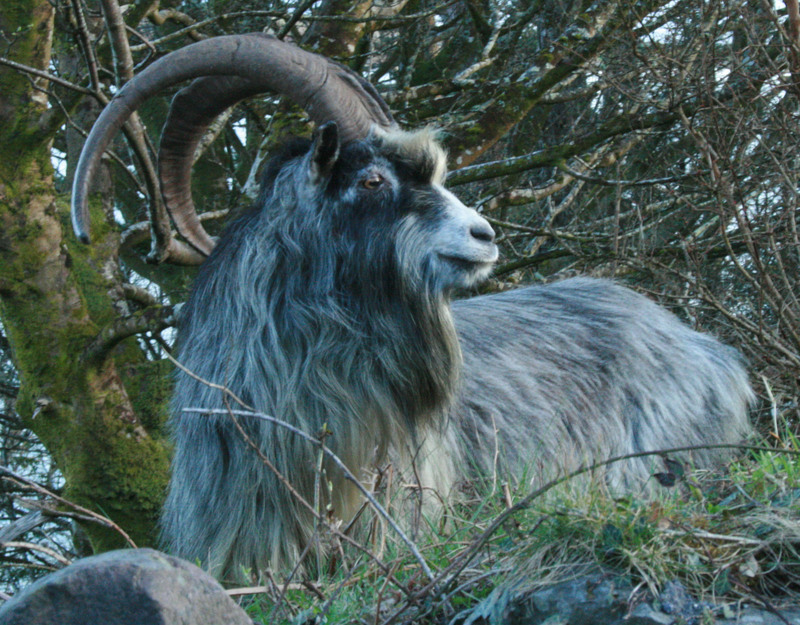 Many people outside Mulranny are only aware of the existence of these impressive native creatures thanks to the tireless work of the Old Irish Goat Society (OIGS). The OIGS was formed in 2006 by a small group of enthusiasts who realised that the breed was rapidly heading towards extinction, but that its gene pool could be preserved if assertive action were taken. Its main aim, therefore, is to help save these heritage animals, so perilously close to extinction, and to create awareness of their plight. The idea is not only to preserve the breed in the wild, but to study its benefits to landscape management; define its phenotype and characterise its genotype; work towards gaining official rare breed status, and thus protection; and create a herd book to preserve its existing standard as an unimproved landrace breed rather than turn it into a ‘standard’ breed. The society also hopes to bring it back into domestication as an ideal smallholder’s goat, pointing out that when kept domestically, the breed could yield up to 200 gallons of milk a year. That’s a lot of goats’ milk. The Old Irish Goat is smaller than other, ‘improved’ breeds. A cold-weather breed, they also have small ears to reduce the risk of frostbite, a long face to warm the air in the nasal passages and a big belly to accommodate large quantities of nutritionally poor forage. Their characteristic shaggy coats of many colours also conceal a thick cashmere undercoat that keeps them warm during harsh weather. The goats’ other distinctive feature has to be their fabulous horns, arching backwards and often swooshing improbably outwards, forming massive hoops and handlebars that proudly describe the age of the head that carries them. Some not only sport eye-catching beards, but fetching hairdos too – the Mulranny goat nicknamed Elvis (AKA Donald Trump) is an especially handsome character. Speaking to The Mayo News, Seán Carolan of the OIGS said that he believed the remarkable Old Irish Goats could one day be seen as instantly recognisable heritage emblems of Mayo, in much the same way that Scottish highland cattle – also magnificently horned – have become iconic emblems of Scotland. Tourists and wildlife enthusiasts would visit the area just to catch a glimpse of them. That is, of course, if there are any goats left to glimpse. The Old Irish Goats’ future, currently so precarious, depends entirely on the society’s efforts in Mulranny and the community’s support. Let’s hope these native animals can be pulled back from the brink of extinction, and that this shaggy goat story turns out to have a happy ending. Read the full story at The Mayo News.